Providing you with news straight from the Swamp! Articles from The Enterprise 360° student-produced publication. The second annual Trivia Night, organized by Quiz Bowl sponsor Barbara Doughty and the Quiz Bowl Team, was held on April 4 in the Shreve Cafeteria. A total of six teams, each with 4-5 people, competed in five rounds with questions ranging in different categories such as science, math, english, sports, world geography, and miscellaneous. Each team was given five minutes per round to work together and answer as many questions as they could. This entry was posted in Enterprise 360 on April 16, 2018 by captains. One sport that is rich in tradition is baseball, and many of its most sacred rules and practices are passed down from player to player. The Shreve varsity team has shared some of their biggest superstitions and rules to live by. Reading about famous baseball players inspired Perot to adopt this rule. Another team player who’s all about superstitions is Anthony Stallcup. On February 7, five Gator football players signed with their respective colleges, ensuring their place on the college football teams. The signing was filled with people eager to see the players sign the papers that would continue their athletic career and take them to a whole new level of athletics. Family members stood behind them, smiles on their faces, as each player stood up and gave a short statement before uncapping the blue pen that would determine their future in athletics. Friends, coaches, and fellow football players were also there, surrounding the green and gold signing table to watch, support, and celebrate with the recruits. This entry was posted in Enterprise 360 on February 10, 2018 by captains. Three student council members, Javin Bowman, Maddie Young, and Georgia Hilburn, received an award at this year’s Louisiana Association of Student Council Convention, also known as LASC. “If you’re asking what LASC is, it’s indescribable, it’s something you have to just come be a part of but if I could sum it up in one word, it would be family,” Javin Bowman said. Georgia Hilburn, a junior and a member of the student council, was chosen to be BESE Student Advisor after going through an application, essay, and interview process. This entry was posted in Enterprise 360 on February 7, 2018 by captains. Before Thanksgiving break Captain Shreve participated in the annual Pack the Pantry School Competition Food Drive hosted by the Food Bank of Northwest Louisiana and placed third in the high school division. The mission of the Food Bank of Northwest Louisiana is to serve as the primary resource for fighting hunger in Northwest Louisiana, upholding a vision to ultimately end hunger in Northwest Louisiana by ensuring a consolidated network of effective food collection and distribution to provide universal access to food for the needy with the communities. According to Executive Director Martha Marak, a total of 42 schools participated in this year’s Pack the Pantry School Competition Food Drive. The total amount collected from all participating schools was 68,584 pounds. This year’s competition allows for the food bank to feed a least 7,000 more people than last year. This entry was posted in Enterprise 360 on December 12, 2017 by captains. During the football season, senior kicker Will Adcock injured his right leg’s quadricep by partially tearing it, and this caused Adcock to miss many games and opportunities. Adcock has gained many achievements and believes the injury is a set-back. He has gotten 1st team all-district defender twice. He was an overall district MVP and was on an all-metro team last year. He was also 2nd team all-district in football last year. Adcock was selected for the Louisiana Football All-Star Game and plans to play in December. He said he sees the injury as a learning experience. This entry was posted in Enterprise 360 on December 4, 2017 by captains. 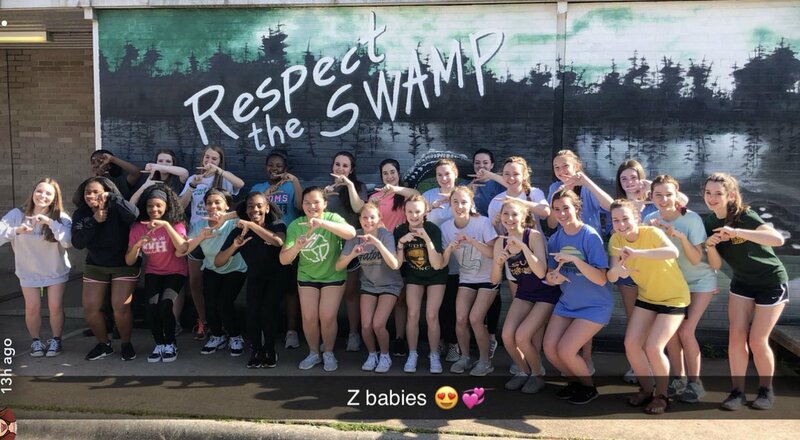 The Gator cook-off, to be held at 3 p.m. on Dec. 2 at Captain Shreve, is an event Z Club has created to replace the pageant that they have hosted in years past. “Gator cook-off features a wide range of events such as coloring with Santa, a gift wrapping station, and of course, tasting all the dishes the competitors prepare,” Co-President of Z-Club Mary Douglas said. This event is a fundraiser for Z-Club and helps to raise money for the organization. Through lots of preparation, members of Z-Club have been working on making this new event a success. This entry was posted in Enterprise 360 on December 1, 2017 by captains. Running back James Ivory III had a record-breaking season his senior year, with 236 attempts and 1,705 yards for the season. “I stay committed until I fall asleep,” Ivory said. This entry was posted in Enterprise 360 on November 29, 2017 by captains. Thanksgiving is a holiday when family traditions are carried out and remembered. Reporter AntZavier Brown asks students about their favorite Thanksgiving traditions, and what feuds may happen when the family gets together. This entry was posted in Enterprise 360 on November 17, 2017 by captains. Members of Student Council attended the Southern Association of Student Councils Conference that was held Oct. 25-30 in Ocoee, Florida. According to its website, SASC is an association composed of 15 Southeastern states. It provides high school and middle-level student leaders with opportunities for networking, building leadership skills, sharing ideas, participating in service projects and getting motivated to make a difference in their schools, communities and in their own lives. This year the conference was held at Ocoee High School. “SASC was an all-around great time, and it was so fun to get to learn from other student leaders not only here in Louisiana, but across the entire South,” sophomore Morgan Hughes said. This entry was posted in Enterprise 360 on November 16, 2017 by captains.